The Under 3’s Karuna Montessori program allows a parent the opportunity to attend with their child for up to two and a half hours once or twice per week in an environment especially set up to facilitate the child’s growing need for independence, order, movement and language. It is a 9 week course during term time and the sessions are held on Tuesdays, Wednesdays and Thursdays 9 am to 11.30am at the Dee Why Scout Hall, 25 Arthur Street, Dee Why and are led by a 0 – 3 experienced Montessori Assistant. What is the Objective of the Under 3’s Program? The overall objective of the Montessori Under 3’s Program is to increase the parent’s awareness of the child’s capabilities and need for independence with a view to transferring the understanding of the child’s stage of development from the Under 3’s program into many applications in the home environment. 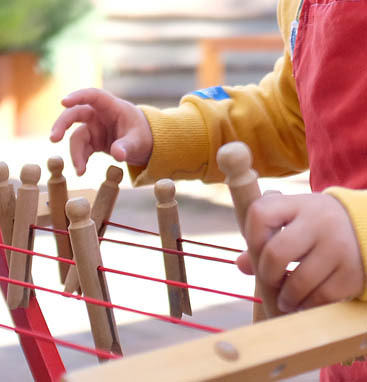 The Montessori Under 3’s program differs from other ‘playgroups’ because the emphasis is in catering for the child’s urge towards independence. All work is set out in such a way that children can use the materials with the minimum of adult assistance and parents are made aware of the importance of allowing their child to complete and repeat tasks without interruption or interference. In this way, the child builds up their attention span. These and other principles in every Montessori environment provide parents with hands-on experience of the practical application of the Montessori Method of education. The child from 0 – 3 years processes a very specific kind of mind by which they unconsciously and effortlessly absorb all that is in the environment. The Absorbent Mind is transitory and only present in infancy. The purpose of the Absorbent Mind and the Sensitive Periods is to facilitate the child’s adaptation to the culture and environment into which they are born. The Montessori Assistant combines their knowledge of human development with knowledge of the specific child and prepares a room made especially for the child under 3 years of age – an environment that is ordered, engaging, challenging and fulfilling for each child. The Montessori approach to education is essentially an ‘aid to life’. It is about assisting the development of human beings during their formative years (0 – 6) and therefore goes far beyond the concept of education as in “school” or “curriculum”. In Maria Montessori’s own words: “our work as adults does not consist in teaching but in helping the infant mind in its work of development.” Montessori believed that the first three years of life form the foundation for the rest of our lives. When working with children, we need to learn to give help only when it is needed and to understand the importance of standing back and observing the ‘unfolding life of the child before us”. By having this special time each week with your child in an especially prepared environment, without the interruptions experienced at home, the relationship between you and your child stands to benefit. It is not the intention to give you a textbook on Montessori parenting; on the contrary, we would just like to pass on some of Maria Montessori’s observations in the hope that they will enrich your life with your child. Soon, her observations will cause you to become more observant yourself and you will be able to draw your own conclusions from them, just as she did. In this way, the 0 – 3 Program assists both parents and children.